This is a list of poppy seed pastries and dishes. Poppy seed is an oilseed obtained from the opium poppy (Papaver somniferum). The tiny kidney-shaped seeds have been harvested from dried seed pods by various civilizations for thousands of years. The seeds are used, whole or ground, as an ingredient in many foods, and they are pressed to yield poppyseed oil. Poppy seeds are less than a millimeter in length, and minute: it takes 3,300 poppy seeds to make up a gram, and a pound contains between 1 and 2 million seeds. The primary flavor compound is 2-Pentylfuran. Bublik bread Ukraine A traditional Ukrainian, Russian, Belarusian and Lithuanian (riestainis) bread roll. By far the most popular variety of bublik has a liberal amount of poppy seeds added to it. Germknödel A fluffy yeast dough dumpling with a mix of poppy seeds and sugar, filled with spicy plum jam and melted butter on top, often eaten with vanilla cream sauce. It is a culinary speciality of Austria, Bavaria, and Bohemia. The dish is served both as a dessert and as a main course. Hamantashen A triangular cookie filled with fruit preserves or honey and black poppy seed paste, eaten during the Jewish holiday of Purim. Hamantashen are made with many different fillings, including poppy seed (the oldest and most traditional variety), prunes, nut, date, apricot, apple, fruit preserves, cherry, chocolate, dulce de leche, halva, or even caramel or cheese. Their formation varies from hard pastry to soft doughy casings. Kalach A traditional East Slavic bread, commonly served during various ritual meals. The name originates from the Old Slavonic word kolo (коло) meaning "circle", "wheel". Kluski z makiem Poland Polish noodles with poppy seeds. Polish Christmas dishes may include poppy seeds because they are thought to help with sleeping peacefully. Kołacz Poland A traditional pastry in Polish cuisine, originally a wedding cake that has made its way into American homes around the Christmas and Easter holidays. The pastry is a light and flaky dough filled with a variety of sweet and savory fillings such as apricot, raspberry, prune, sweet cheese, poppy seed or even a nut mixture. Kutia Ukraine A sweet grain and poppy seed pudding from Ukraine. Lemon poppyseed muffins or cake United States These are popular in the US. 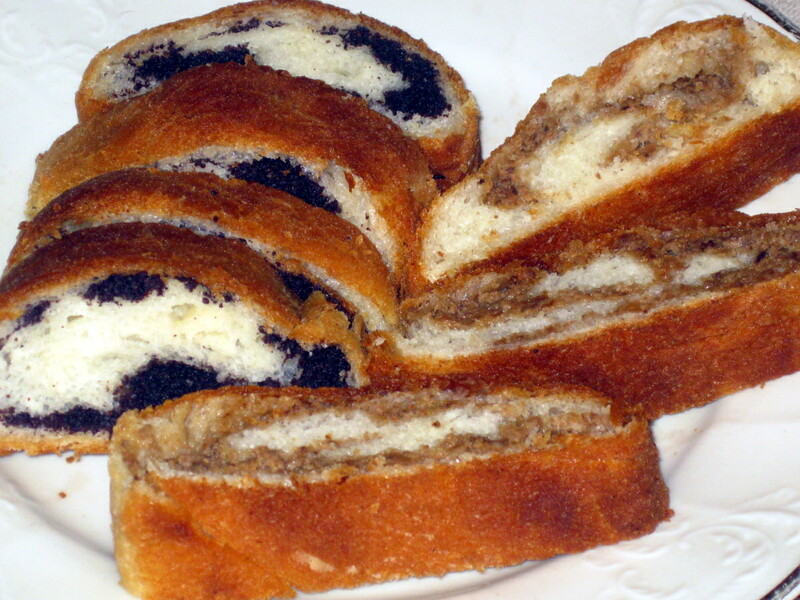 Mákos bejgli Hungary Hungarian poppyseed roll, also known as "Christmas bread"
Mákos metélt (Hungarian poppyseed pasta) Hungary A dessert in Hungarian cuisine made with noodles, poppy seeds and sugar. Makówki A traditional poppy seed-based dessert from Central Europe. It is most notable in Silesia, where it is served almost exclusively on Christmas Eve (and perhaps on the following days, as long as the supply prepared for Christmas lasts). Poppy seed bagel Bagels with poppy seeds, often on top. Poppy seeds are sometimes called by their Yiddish name, spelled either mun or mon (written מאָן) which is very similar to the German word for poppy, Mohn, as used in Mohnbrötchen. Poppy seed kolache (or kolachy) A type of pastry that holds a dollop of fruit rimmed by a puffy pillow of supple dough. Originating as a semisweet wedding dessert from Central Europe, they have become popular in parts of the United States. The word kolache (колаче) itself means 'a small cookie' in Macedonian. Poppy seed roll A pastry consisting of a roll of sweet yeast bread (a viennoiserie) with a dense, rich, bittersweet filling of poppy seed. An alternative filling is a paste of minced walnuts, making it a walnut roll. The dough is made of flour, sugar, egg yolk, milk or sour cream and butter, and yeast. The dough may be flavored with lemon or orange zest or rum. The poppy seed filling may contain ground poppy seeds, raisins, butter or milk, sugar or honey, rum and vanilla. It is popular in parts of Central Europe, Eastern Europe and in Israel. It is commonly eaten at Christmas and Easter time. Sushki Russia Traditional Russian and Ukrainian tea breads. Similarly to the bubliki, they are often topped with poppy seeds. Usually, poppy seeds are also added to the dough. ^ Yearbook of Agriculture. United States Government Printing Office. 1896. p. 203. ^ Harold McGee (2004). On Food and Cooking: The Science and Lore of the Kitchen. Simon and Schuster. p. 513. ISBN 978-0-684-80001-1. ^ Julian, Sheryl (2000-12-20). "Seasoned celebrations on Christmas Eve, making the traditional Old World feast is a family affair". Boston Globe. Retrieved 2009-03-17. ^ a b Kari A. Cornell; Robert L. Wolfe (2001). Holiday Cooking Around the World: Revised and Expanded to Included New Low-fat and Vegetarian Recipes. Twenty-First Century Books. p. 43. ISBN 9780822541288. ^ Ginsburg, Ezra (2009-01-07). "Joyous, family celebration marks Ukrainian Christmas". Sun Media (Winnipeg). Retrieved 2009-01-24. ^ "Mâkos és Diós Kalács," in Bernard Clayton; Donnie Cameron (2003). Bernard Clayton's New Complete Book of Breads (30th ed.). Simon and Schuster. pp. 308–10. ISBN 9780743234726. ^ Mayer, Christina (2005). Hungarian Phrasebook. Lonely Planet. p. 178. ISBN 9781741042320. ^ "Hungary: "There is no need to amend our EU communication strategy"". Euractiv.com. 2006-02-06. Retrieved 2009-01-24. ^ "Recipe Exchange". Hartford Courant. 2004-09-23. p. G4. Retrieved 2009-03-17. ^ Maschewski, A. (2005-11-27). "Kunstvoll und facettenreich". Berliner Morgenpost. Retrieved 2009-03-17. ^ "Filling Vienna's Sweet Tooth". New York Times. 1977-06-08. Retrieved 2009-03-17. ^ Seeger, Sabine (2007-12-19). "Der Tannenbaum des Anstoßes". Südwest Presse. Retrieved 2009-03-17. ^ Frederic Gomes Cassidy; Joan Houston Hall (1985). Dictionary of American Regional English. Harvard UP. p. 256. ISBN 9780674205192. ^ "Poppy Seed Kolache". Simply Recipes. 2007-09-30. Retrieved 2009-01-16. ^ "Czech, Please: 2000s Archive : gourmet.com". Prod.gourmet.com. 2011-08-01. Archived from the original on 2012-03-17. Retrieved 2012-02-20. ^ Dorcas Guild of the Magyar United Church of Christ, ed. (1960). Hungarian recipes. Elyria, Ohio. p. 44. ^ Janez Bogataj; Lučka Letič. "Taste Slovenia" (PDF). Slovenian Tourist Board. Archived from the original (PDF) on 2009-02-10. Retrieved 2009-01-19. P. 12. ^ Ursula Heinzelmann. "Chilled Bread and Poppy Seed Pudding". Saveur. Retrieved 2009-01-17. ^ Marcus Samuelsson. "Lime-Scented Poppy-Seed Rice Pudding with Mango". Food & Wine. Retrieved 2009-01-17. This page was last edited on 26 January 2019, at 23:22 (UTC).